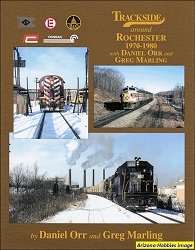 The New York Central System that Sandy Goodrick experienced in 1949-1955 was in a life or death race with inflation and loss of revenue to competitors. Of all the things management could do to meet the squeeze of traffic decline and expense inflation was to dieselize. Dieselization was concentrated on the eastern half of the NYC leaving the western half an operating museum for steam. Many first line trains were still powered by J-3a Super Hudson's between Cleveland or Detroit and Chicago. Before 1953, Niagaras were relatively rare on the west end, but then they too appeared in great numbers. 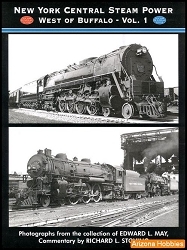 Also included are some photographs of the South Bend terminal, the CSS&SB, and a Studebaker Corporation ALCO S-1! Notre Dame Football Specials, pp. 110-128.